Located in Madrid’s most multicultural neighborhood, Lavapies, La Tabacalera (Spanish for “Tobacco”) was a former tobacco factory turned into a major self-managed art hub. Right after my visit to the legendary Thyssen-Bornemisza, I found La Tabacalera close by so thought I might as well check it out. I usually research the places I go to beforehand, but I knew nothing about La Tabacalera before going, however, my experience was nothing below spectacular. It’s so different from any museum or cultural centre I’ve seen before. Let’s start with the exterior first. The building is surrounded by urban street art with the popular "Muros Tabacalera;" a series of murals that involved global street artists, from Ruben Sanchez, Okuda San Miguel, Deno and much more supporting the Madrid Street Art Project. The building itself is a massive industrial structure on 9200 m2 land with only 33% of it being used. But what’s so special about La Tabacalera? The direct involvement of the people. The main objective behind La Tabacalera is encouraging cultural and artistic practices with a low cost so that everyone that is devoted to social and cultural transformation through any art form is free to display their work and ideas. From holding exhibitions, workshops, dances, theater, film screenings…literally any form. You get an open invitation to the encompassing and diverse creative skills of people through different modes of expression. It’s refreshing. And because it’s deeply devoted to intercultural coexistence and the exchange of ideas, La Tabacalera prides itself in providing the universal right of access to culture and art. Right at the entrance is a friendly security guard in the foyer with information about the exhibition leading to a huge space in the middle with several hallways attached. Above are some of the hallways that lead to different sections in the exhibition. Personally, I always like to look around, get the idea of everything till I get to the end then make my way back looking at every piece, (in exhibitions, museums or even open-buffets) I don’t ­­know if that’s weird or not but I find it the best way to get the most out of my experience. Albeit it takes a tad bit longer, but in the end it feels satisfying knowing that I was able to absorb everything in a proper manner. I was in love with the interior. 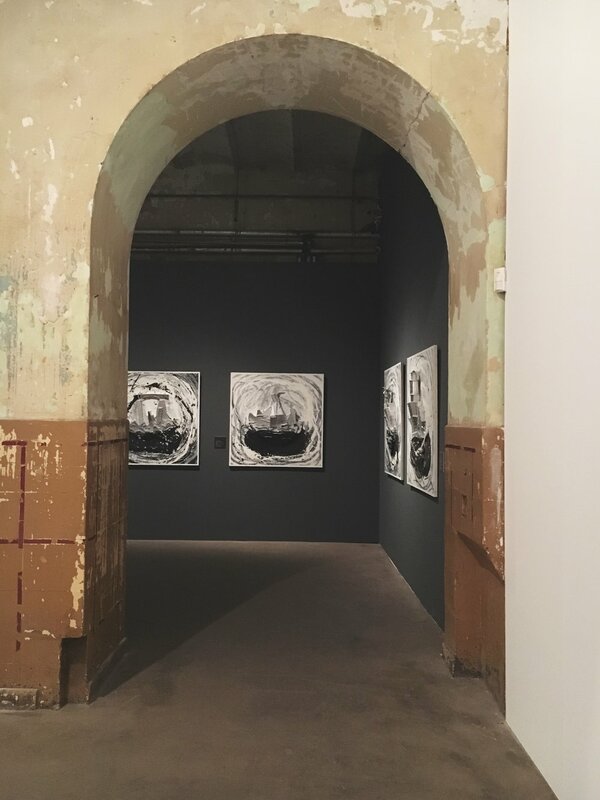 It reflected the building’s history by preserving the peeled walls and ceilings to the exposed air vents, and the minimal yet strong lighting; you could definitely feel the old factory assimilating within the artwork. I was there last July and at the time there was a great Fernando Bellver exhibition showing. I had never heard of him before then but I became his biggest fan from that point on. The exhibition was called “Vida Pasajera” which translates to “Passenger Life." I found that the hat, glasses and pipe are pictoral symbols that represent Bellver’s persona and are repeatedly used in some of his work. Bellver introduces us to his iconographic world, and takes us on a journey as “passengers” through his work, which took the entire floor. There were nine sections and around 80 pieces of Bellver’s work from the last 30 years of his career. Interdisciplinary methods from sculptures, etchings, oil paintings to radiography. Here you can see the repeated hat, pipe and glasses. "que suerte que me quieras": "how lucky that you love me"
Fernando Bellver’s work requires an acquired taste. Especially in this exhibition, where he explores art from a humoristic dimension; mixing current pop culture with historical figures. I was pretty impressed. And what I loved most was how each section was completely different and unrelated to the other. You would think that nine different artists took part in the exhibition. Each section’s artwork devises a completely different approach and technique, revealing the fluidity of his style. "la virgen de la chica"
one of my favourites from the exhibition. I literally sat on that bench for10 minutes just staring at his work. It was especially dark for this display and the colours were so lively and beautiful. As an artist, Bellver has an indefinite style, which at first left me confused because as an artist myself, I’ve been trying to work and develop a certain style in my craft for a long while until I found that it’s really so much more beautiful and liberating to not limit yourself to any technique or “signature style.” So what if no one can recognize a Bellver painting or sculpture? That’s the beauty of it. He’s made himself unrecognizable behind all the range of works he’s mastered, by essentially freeing himself from all limitations. This observation left me in awe. While it is important to have a unique style, it made me realize that it’s not the only way to go. I’ve always admired artists with a distinctive style and they’ve always been praised for it, from Picasso to Klimt to Frida Kahlo, who are undoubtedly fully deserving of being celebrated, but what about the artists with the chameleonic nature? Something to think about. Comment your thoughts. What do you think of Bellver’s work? Should artists always look for that “one unique” style and stick to it? La Tabacalera, 53, Calle De Embajadores, Lavapies: easy metro access from the Embajadores metro station. An added bonus: La Tabacalera is only a ten minute walk away from the Golden Triangle of Madrid!